Dave and I have *just* returned from 2 and a half weeks in Japan, where we spent the bulk of our time in Kyoto. The beauty of staying put in one place for so long is the chance to revisit places you REALLY liked...such as my beloved Nomura Tailor. I went there about 5 times, making purchases three of those time and just perusing all the goodies the other times. It was...bliss! 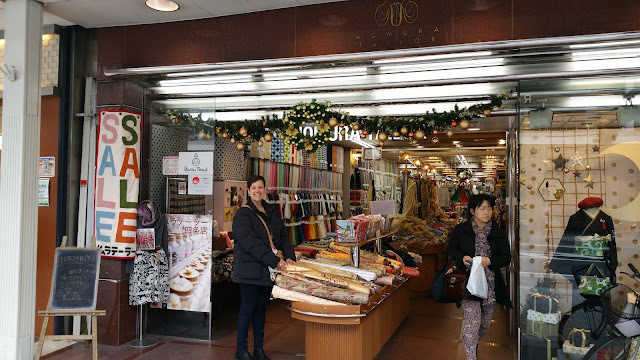 There are two Nomura Tailors in Kyoto, one on Shijo Dori (the bigger store with ALL the fabric), and a second smaller store, around the corner in one of the arcades at the end of Nishiki Market (there are two arcades parallel to each other and I cannot remember which one it is in). The smaller stall sells some haberdashery and quilting items. 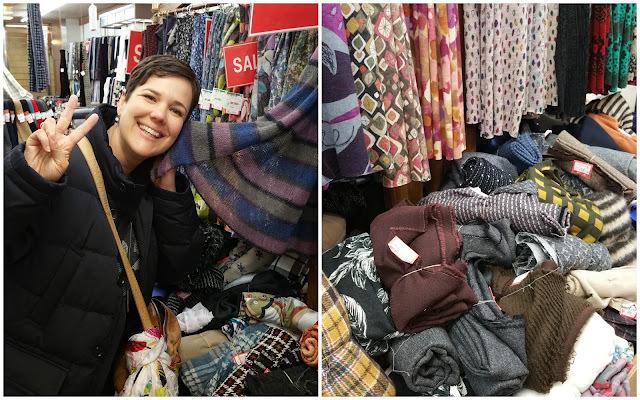 Needless to say I spent most of my time in the big fabric store...with most of that time up on Level 2 where the knit fabric lives. I bought this lovely wool (?) for what I hope will become a lovely "coatigan" - B6244. The pattern has a shawl collar that shows the underside of the fabric (the lighter side) and I think (hope) this will work out really well). 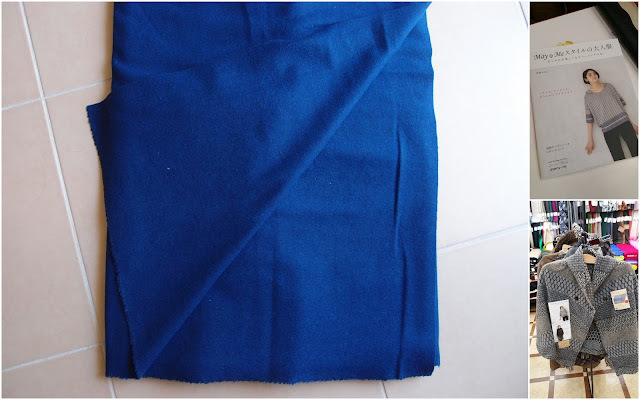 I hope not to hem the shawl part of the garment, rather use the selvage; or stitch it so I can fray the edges. Nomura Tailor have a few different patterns made up, including the little cape in this photo. I tried it on and it fits (pretty much) so then I set about finding a fabric that I could use to make it. Nomura has HEAPS of wools, mostly in plaids, but I knew matching the plaids would make my head explode, so I went for this lovely blue fabric. I spent about 2 hours choosing this fabric - my head exploding at ALL the choices on offer. After some sign language I ascertain the pattern is from this Japanese pattern book so I purchases that too (hopefully I'll be able to decipher the pattern, otherwise this material might become something else, like a Seamwork Camden Cape). Initially I had thought this fabric would work for the B6244 coatigan, but it has quite a bit of stretch so I walked out of the shop and left it behind after fondling it for about an hour. 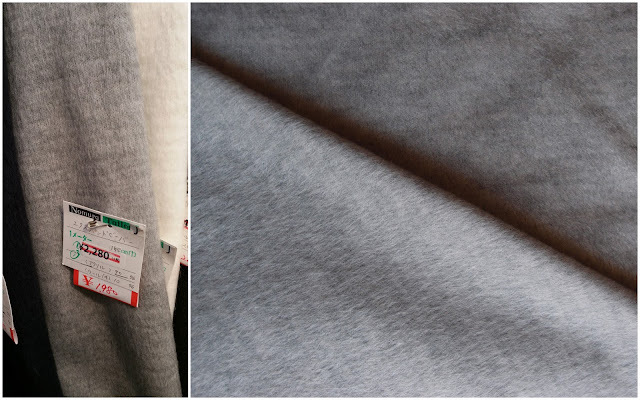 I then went back a few days later as I thought the fabric so was nice plus super soft and cosy that it deserved to come and live in Australia with. More agonising ensured about which colour - black, navy blue or grey. That decision took me hours also! I have no idea what this will become yet...hopefully a nice cardigan or coatigan if I can find a good pattern (suggestions welcome). I bought a similar fabric to this back in February and it became a Linden Sweater which I think is a great way to show off the double sided fabric. This fabric will suffer the same fate...with the polka dots serving as the contrast fabric on the bands. And last, but by no means least, is 1.5m of this lovely fabric that I found in their remnant bin - the colour combination is olive and mustard. Delish. The remnant bin at Nomura can be the source of hours of happy rummaging...trust me, I know. I see this becoming a Mandy Boat Tee - it has a bit of a "wool" feel to it, so it will be a nice winter top. I love everything I bought and I'm glad I have visions for some of it straight away. I also loved that with JAL we had 50kg luggage allowance EACH so I could go as crazy at the bank balance would allow with my fabric shopping.